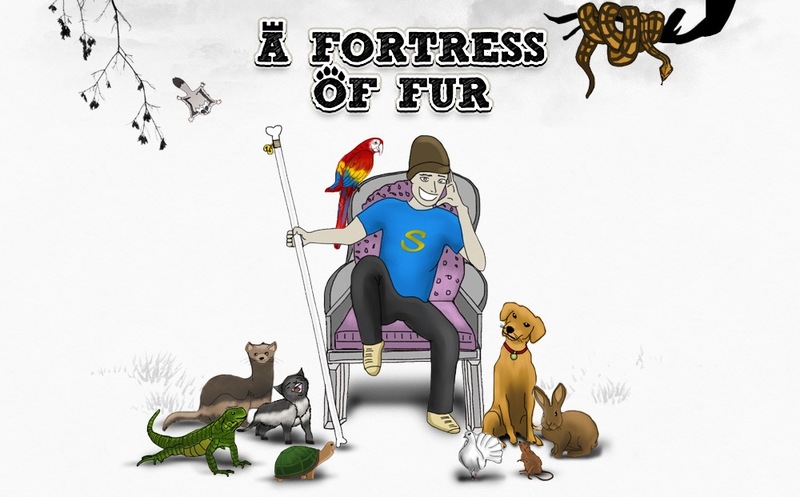 A Fortress of Fur: Oh My Hump! Everyone has different obsessions. While some may come across as rather peculiar to you, it’s not the case to those who appreciate it. I have to make such an opening because today I’m talking about people who’re obsessed with humps. Yes HUMPS!! 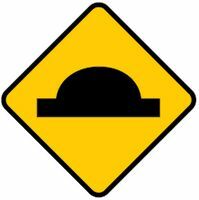 Aaahh ahhh wait…It’s definitely not the dreaded road humps that destroy your cars. 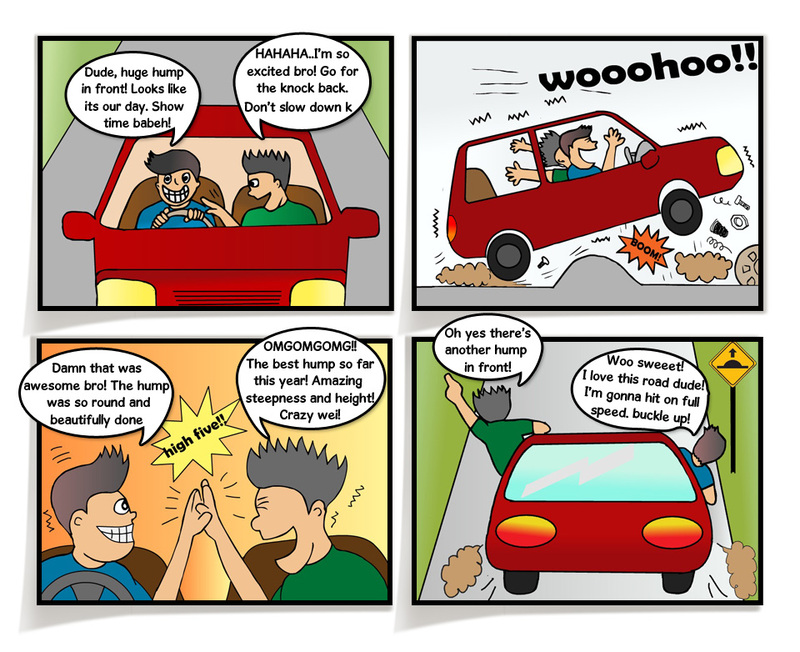 No one will ever love the road humps..Duhhh…(exception for the two psychos in the cartoon above). However, if these humps were to exist in other places, people might just fall in love with them and begin to rave about its beauty. Ever heard of Flowerhorn? Maybe you don’t know by the name but probably you would’ve seen it before. This is the fish. A look that you won't forget easily. Simply because you know why. The Hump! Incidently, there was a Flowerhorn competition in town last month and I was very curious to know what else that's so special about this fish which became a craze in the early 2000. It was like the Gangnam Style of sorts for fish enthusiast back then and its popularity is expanding all over the world now. So I made a trip to Meng Aquarium Centre Fish Farm, in USJ1, Subang Jaya to learn more as they held an event called- Malaysia Flowerhorn Competition 2012 last month. Upon arrival, the hobbyists there gave me a warm reception and I instantly felt the exuberating good spirit. I had extended conversation with the venue owner Terrence, judge Sonny Gay along with fellow enthusiasts Erick and Nicholas. Terence affirmatively answered that, besides the distinct and unique hump on the head, flowerhorns are one of the more interactive fishes out there. It has interesting character and easy to train. 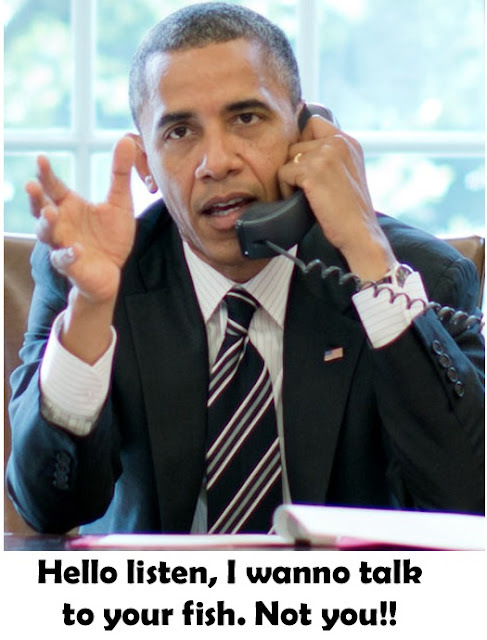 He likened the fish to dogs. They will come when you call. You can pet the fish and ‘sayang’ them. You can even play with them. ( But of course don't be too ambitious and expect the fish to play snooker or mahjong with you lah). 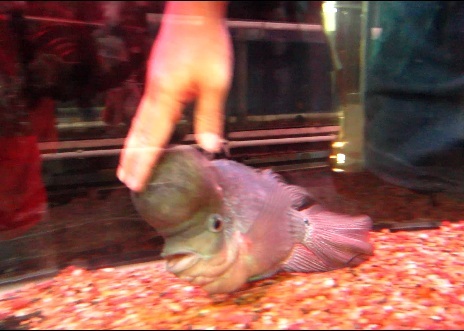 Erick did a demo on petting, and the fish loves it! Terence also told me a story about this particular worker who talks to his boss’ fish everyday. Apparently, every time the fish sees this man approaching the aquarium, it will go happy nuts swimming all over the tank in joy while receiving the person. Ironically, the fish doesn’t even react like that to the owner himself who feeds the fish everyday. This proves that interaction and bonding can be created with Flowerhorns. Certainly a fish with character and personality. And probably you might feel much better talking to the fish than to some really boring people. 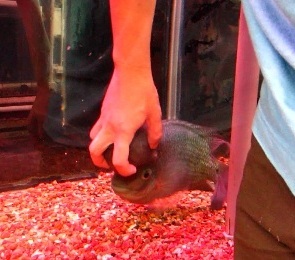 Flowerhorn was founded in the late 90’s and rose to popularity in year 2000. It was perhaps the flavor of the new millennium. 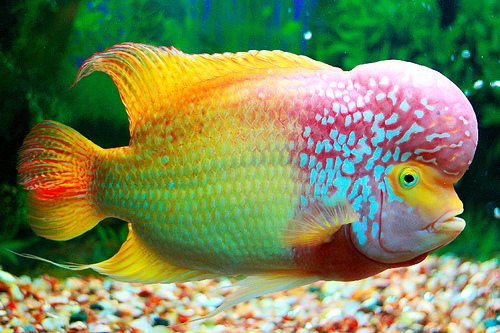 Flowerhorn is no doubt a hybrid fish. The hump was inherited from some territorial fish. According to Terrence, the original hump in territorial fish is full of protein. It comes handy during mating season where they don’t eat and use it as generator-like reserved energy. So the next time you see someone with a hunchback or hump in any part of the body, don’t laugh! He or she has got more chances to survive famine and starvation than you. This year the flowerhorn competition took 157 participants from all over the country. I was wondering how is the judging done. Upon listening, I found out that it was very technical. And I guess I will have to make another separate post to delve deeper into it. But generally, the aspects they look into are namely, the anatomy. The beauty of hump (rounder, balanced and big). Markings, Colour and of course the Character. As a result of random questioning, only after about 40minutes into the conservation, I casually asked something. “Where is the birthplace of the flowerhorn?”. All of them (about five in the room) firmly answered to a chorus “it’s a Malaysian fish!!! You’re talking to one of the pioneers who bred and founded this fish!! !” And Terence wasted no time to humbly remind me: “I gave the name to the fish. FLOWERHORN is the name that I gave to this fish”. Inside my heart I was like,- holy shitttt!! It’s a Malaysian fish ahhh??? How the hell did I miss that. Kamfa Free Marking Champion, Winner of Best Body and Best People's Choice prize. While Erick was explaining to me why this fish got the best body prize, I kept analysing,- what made this one a stand-out. What is their definition of best body? 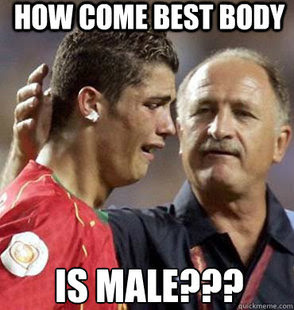 He said the anatomy was proportionate, more balanced, has right ratio, right curves and etc. Not that I know how to compare but all I understood was, in their eyes, this fish is equivalent to a certain Kim Kadarshian. Voluptuous!! Next will be the Grand Champion. This fish also won the Pearly Free Marking (category B) and Best Pearl prize. The red eyes are kinda scary. This guy looks like he's been possessed by some ghost that has an eyesore. But naturally he's fine. The eyes are meant to be like that. Ultimately this fish was one of the big winners for the day. Probably one that came out with perfect 'specifications' and the least fault. This one above won the Golden Base 2nd Runner up and Best Colour prize. If I remember correctly, Golden Base is a phase like shedding for dogs. The fish actually loses colour before coming back to full condition. (correct me if i'm wrong). This beauty here won the Best Flower prize. I don't have to explain I guess. He just blends effortlessly with the title, regardless whether you know about Flowerhorns or not. Just look how beautiful he is. 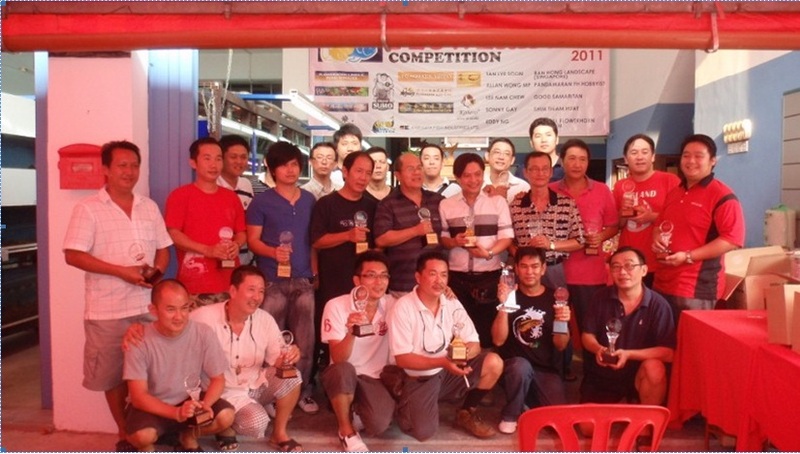 Group photo from year 2011 competition. Most of the people I met are inside here. and.....the Know-Nothing Judge Award from me goes to all these people up here. Yes! The fish aside.., what amazed me the most during my trip was, the passion, dedication and teamwork shown by all these people to put together this annual event. Just so you know, the prizes were not 'cheap'. Hence most of them chipped in whatever they can afford. Sponsorship, venue, effort and knowledge. For example, Terence had to stop his business for a month and move his own fishes elsewhere to prepare benching-in for the competition. No business for ONE MONTH! Judges who came all the way from Singapore were not paid anything. Not even the hotel stay. All this was done voluntarily to sustain and rejuvenate their hobby. To preserve their love for the species. 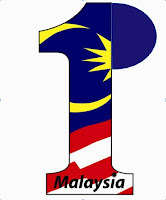 To enjoy the game and to continue uphold the pride of this Malaysian born beauty! Hobbyists having great time together. Keep up the spirit guys! Note: Stay tuned for more related post in near future. Clue? I'm gonna delve into issues related to luck, prosperity, psychology and oh ya....fish! Don't you want to get another one? There are cheap ones as well. It depends on the quality. The hump and colour are apparently a huge factor in the pricing. 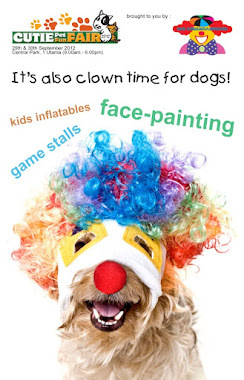 Cutie Pet Fun Fair 2012! Featured: Papa Hero of Kakimotong Fan Club!